Wow. Would have been a fun way to get rid of all those stupid AOL disks that we all use to get. I used they as coasters for my coffee cup, but this would have been better! A ‘reaper tool?’ Do you mean a scythe? Because it does in fact look like a scythe. Reckon you make me some biscuits. Would love to see this launch hard drive platters. Might need to make one. O M G finally a use for that stack I’ve been saving. Very cool…but needs to be built into the arcade gun from the 90’s classic “Revolution X”. In the game the guns shot CDs instead of grenades or other incendiary devices. 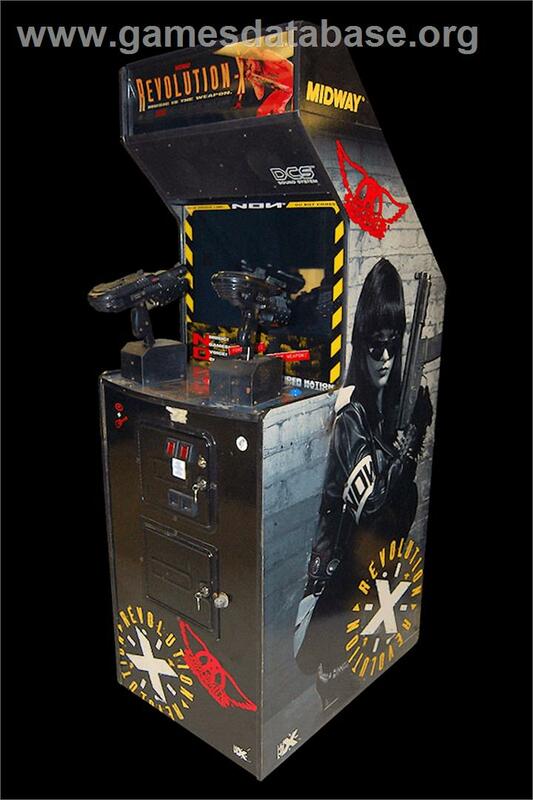 Ahh… yes… the classic Aerosmith-endorsed arcade shoot-’em-up. This looks like a load of fun. CD trap shooting? Robot-mounted CD turret? The video was fun to watch until the launcher went full throttle. Then it became ridiculously awesome ! I couldn’t help thinking ” Disc of Tron” when they started bouncing off of things. Now all we need is some black lights and a little flourescent paint line art around the place. The cenobite from Hellraiser 3 called. He wants his launcher back. Interesting. The CDs look square as they get fired. Anyone know why? Something to do with how the camera image sensor works perhaps. Different sensors have different bugs with motion. This looks like it was recorded with a CCD, because the moving disks blur to become squares of all the space they pass through during each frame capture, like Andy said. that’s not a grinding head it’s a wheel that seems to be off set and be (belt?) driven from the grinder. As I understand it, the wheel we see is not driven. The grinder drives a wheel below the plate. The visible wheel just presses the CD against the driving wheel. Pretty cool, but two years old. https://www.youtube.com/watch?v=JOb6Z5Tja68 after the 9 minute mark: enters the turbine. Reminds me of the last days of BlockBuster. To those that keep saying it “reminds you of” something… I don’t know if you didn’t have toys as a kid, or didn’t watch toy commercials, or what. It’s a scaled up version of a VERY popular kids toy. For my generation the TMNT “pizza thrower” was the name of it, but He-man, I think gi-joe, and various other action figure lines have all had their incarnations of it. Put little plastic discs in a hopper, shoot them at the cat….good times.